This is a simple adaptor class. This class does not encounter output errors. 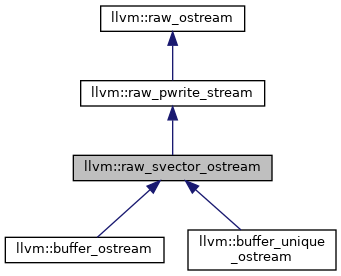 raw_svector_ostream operates without a buffer, delegating all memory management to the SmallString. Thus the SmallString is always up-to-date, may be used directly and there is no need to call flush(). Definition at line 509 of file raw_ostream.h. O The vector to write to; this should generally have at least 128 bytes free to avoid any extraneous memory overhead. Definition at line 525 of file raw_ostream.h. Definition at line 534 of file raw_ostream.h. References llvm::SmallVectorTemplateCommon< T, typename >::data(), and llvm::SmallVectorBase::size(). Referenced by llvm::ComputeASanStackFrameDescription(), llvm::NVPTXAsmPrinter::doInitialization(), llvm::MCDwarfLineAddr::Emit(), llvm::MCDwarfFrameEmitter::EmitAdvanceLoc(), emitDebugLabelComment(), emitDebugValueComment(), EmitGCCInlineAsmStr(), llvm::AsmPrinter::emitImplicitDef(), emitNullTerminatedSymbolName(), llvm::MCTargetStreamer::emitRawBytes(), llvm::MCStreamer::EmitSLEB128IntValue(), llvm::MCStreamer::EmitULEB128IntValue(), llvm::MCTargetStreamer::emitValue(), llvm::opt::Arg::getAsString(), llvm::ExecutionEngine::getConstantValue(), getGNUBinOpPrecedence(), getItaniumTypeName(), llvm::AMDGPUMangledLibFunc::getName(), getOpenCLAlignment(), getPrefixes(), getRelaxedOpcode(), isOperator(), LLVMDisasmInstruction(), LLVMTargetMachineEmitToMemoryBuffer(), llvm::ExecutionEngine::LoadValueFromMemory(), printDwarfFileDirective(), printFPOReg(), llvm::FileCheckPattern::printVariableUses(), llvm::ARMAsmBackend::relaxInstruction(), llvm::opt::Arg::render(), llvm::report_fatal_error(), llvm::NVPTXAsmPrinter::runOnMachineFunction(), llvm::StructType::setName(), llvm::UpgradeSectionAttributes(), and VisitGlobalVariableForEmission().